Ariana says she doesn't need to use Kanye for promotion. (AllHipHop News) Ariana Grande recently found herself in the midst of some Kanye West debauchery, which took place on none other than Twitter. While Kanye again makes headlines, this time going at it with his competition Drake, he didn't appreciate Ariana’s side comments. 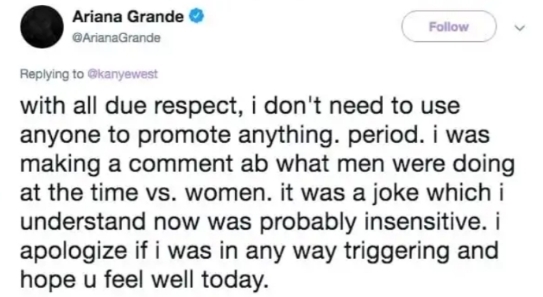 The “thank u, next” pop star quickly returned to her timeline to apologize to Ye directly, and explain herself.